I know, the holidays are over and we’re totally done with all the baking and indulging, and maybe right about now you’d rather be reading about a fantastic cabbage soup recipe that will restore your systemic equilibrium and help you drop the 10 lbs you put on in the last week. OK, me too. But does January 2rd have to be that austere “back to reality-I’m only eating cabbage for a month” kind of day? Is this really how we want to start the new year? Well, yes and no. Yes, I did ceremoniously throw away all the leftover holiday cookies and tempting goodies lying around, but I could not, I repeat, could not let go of these. Yes, there are a couple left and they’re staying. I love them. Granted, these are not the most beautiful biscotti you will ever make. 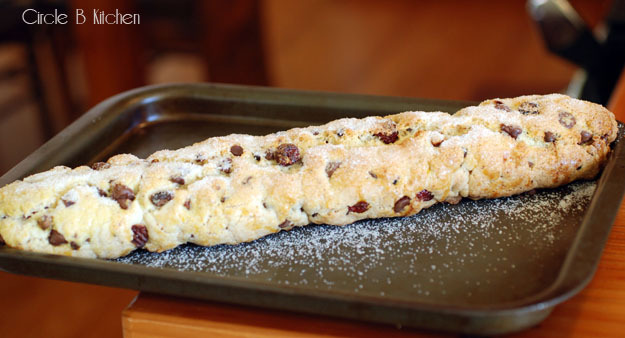 The dough is rather craggy and a little crumbly to work with, but the resulting biscotti is so delicious that you will immediately forgive it these sins. Oh, and then there’s the part about the bits of cranberry, toasted pecans and chunks of chocolate, and now you know why I could not willingly part with these. Did I mention that these biscotti are studded with hunks of chocolate? And cranberries. Sigh. This is how I want to start the new year. If 2011 is going to be any good for me at all, I have to start out with a contented sigh and a smile on my face. I think these would go very well with cabbage soup.